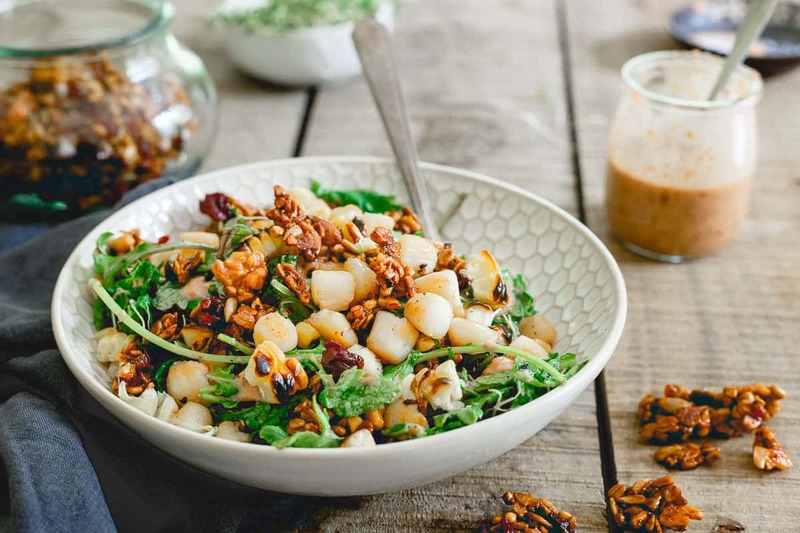 *This Bay Scallop Baby Kale Corn Salad recipe was developed in partnership with the Cherry Marketing Institute. This bay scallop baby kale corn salad is served with a savory tart cherry granola and a cherry dijon dressing. Eating well in the summer never looked so good! The kind where you throw a bunch of lettuce in a bowl, maybe another chopped vegetable if you have it in the fridge, pour some bottled dressing on top and eat as a side solely in an attempt to get some greens in for the meal. Or, the kind that you take your time with and make a meal out of. You make your dressing from scratch, cook a protein to top it and think carefully about what else you add to the bowl. You want things that contrast texturally and complement from a flavor standpoint. When you finally sit down to eat it, it might’ve taken you just as long as a normal dinner to prepare. 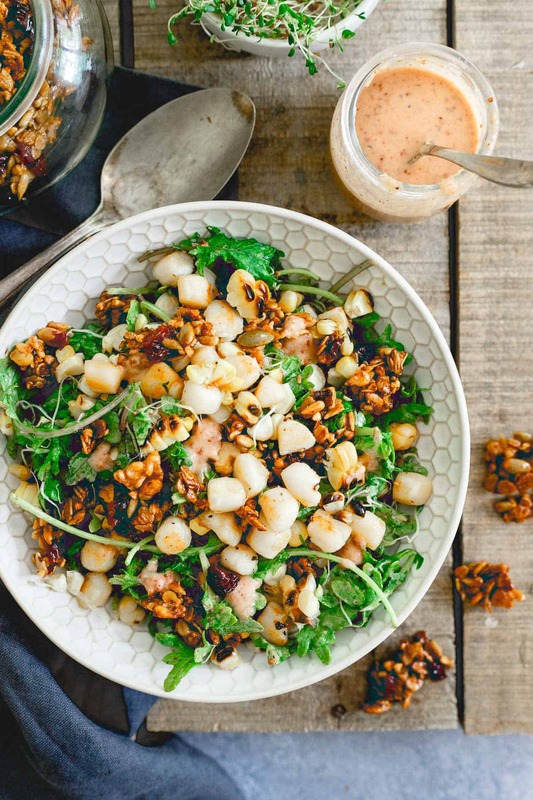 Both have their place but this bay scallop baby kale corn salad is most definitely the latter. And that’s ok, because it’s (almost) summer and totally “in” to eat salads as a meal. Right? Ok, that’s at least how I’m justifying the time and effort of making granola from scratch as part of this recipe. 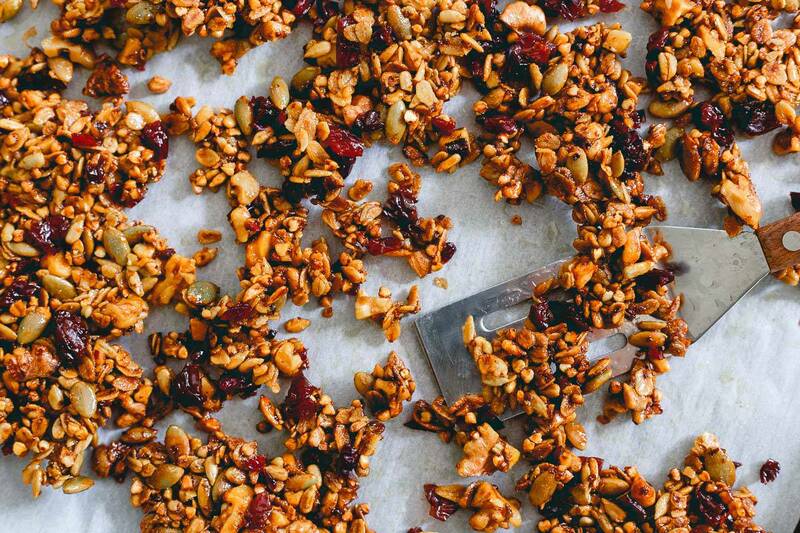 Speaking of granola, can we talk about this thing called savory granola for a second? Um, woah. Why haven’t I done this sooner? For all the delicious sweet granola out there (like this tart cherry chocolate granola or this paleo gingerbread granola) that I’ve made more times than I can count, I have no idea why a savory one didn’t pop into my brain sooner. With the caramelized scallops and grilled corn, I wanted something crunchy in this salad or feared it’d just be a bunch of mush with each bite. Since throwing seeds and nuts into salads is pretty commonplace, I figured why not make a granola out of those things, weave in my beloved Montmorency tart cherries that I had already planned on putting into the dressing and not only get that textural variety I was looking for but also reap some of the awesome potential benefits, like the anti-inflammation properties of the tart cherries. Their sweet yet tart flavor also goes perfectly with the savory elements of the salad and definitely stands out with each bite. With summer practically here, I find myself working out more (it’s just more fun when the weather is nice!) and in an almost constant state of soreness. If I can come home from a workout and not only recover nutritionally with salads like this one (it’s got a great protein/carb/fat ratio going on) but aid my muscles in the recovery process while doing so, I call that a pretty darn good meal! 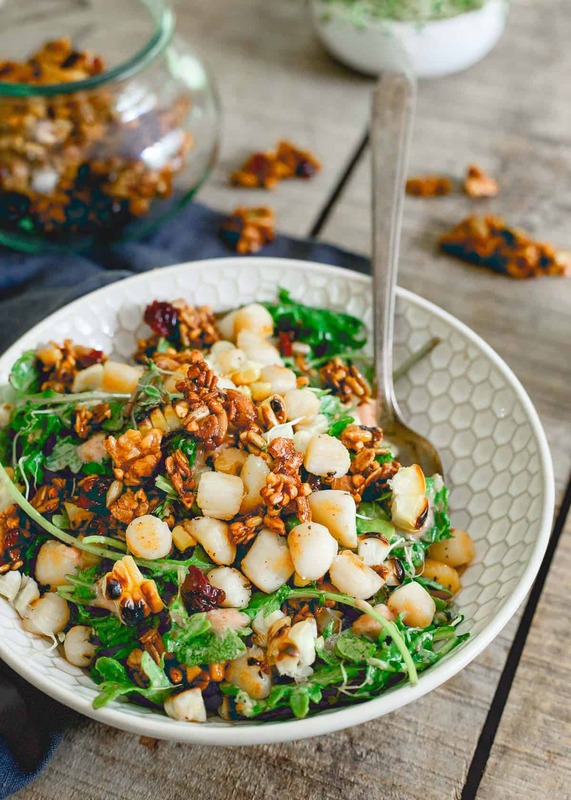 Love this bay scallop baby kale corn salad recipe? Try other delicious salads like Chopped Crispy Citrus Chicken Salad, Tart Cherry Balsamic Grilled Summer Vegetable Orzo Salad, Tart Cherry Glazed Ahi Tuna Kabobs over Spiralized Winter Salad and Baby Kale Chicken Cherry Salad. Combine the oats, walnuts, sunflower seeds, buckwheat groats and pepitas in a large bowl. Whisk together the olive oil, honey, mustard, salt and pepper in a small bowl. Pour the wet ingredients into the large bowl and toss until well combined. Spread the mixture out onto the baking sheet in a single layer and bake for 18-20 minutes, tossing once halfway through until granola starts to turn golden brown and crispy around the edges. Remove from the oven, add the dried tart cherries to the baking sheet, toss to combine, spread into an even single layer and let cool. Place the kale, corn kernels and sprouts in a large bowl, set aside. Once hot, add the scallops and cook until golden and starting to caramelize on one side. Flip and repeat on the other side. Add the scallops to the large salad bowl. Pour dressing over top and toss until well combined. Break up the granola into small pieces and add to the salad bowl. Toss again lightly before serving. This is so super lovely. What a beautiful way to use tart cherries! This is so pretty and I love the flavors! YUM! using the tart cherry juice in the dressing is brilliant! love this! 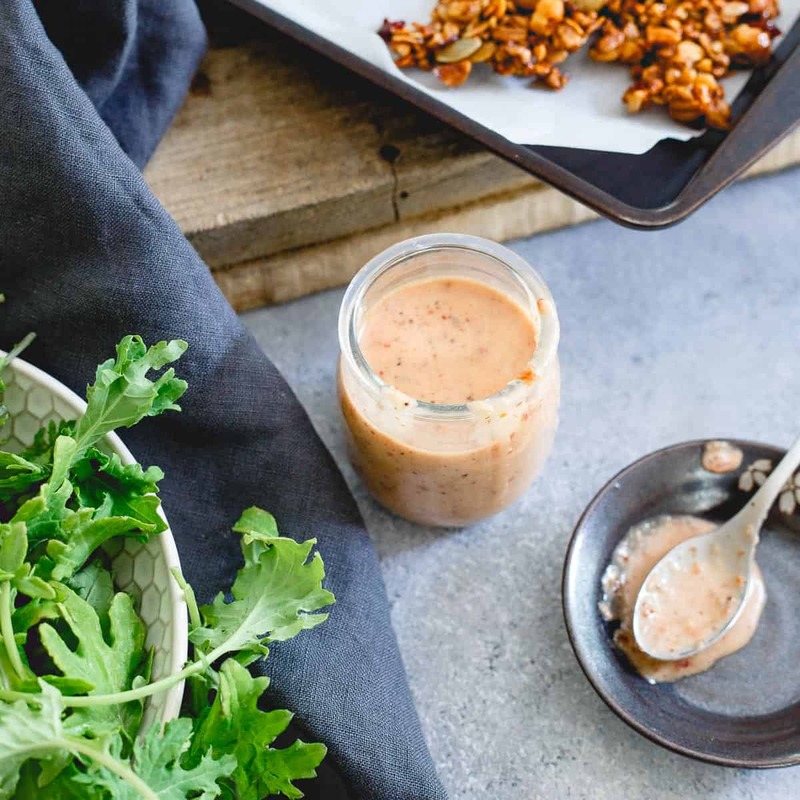 Ummm DYING over that cherry dijon dressing!!! You’ve just blown my mind…so many amazing flavors and textures going on here, besides the fact that bay scallops are my favorite thing EVER! What a fabulous combination Gina! I would have never thought of adding the granola. Great idea! What an incredible salad, loving all the flavors and textures! What a brilliant salad! I make a salad for lunch pretty much every day, and my husband always comments how long it takes to create, and what a mess I make! But it’s the only kind of salad to make!